A day like any other for security chief Tracy Waterhouse, until she makes a purchase she hadn't bargained for. One moment of madness is all it takes for Tracy's humdrum world to be turned upside down, the tedium of everyday life replaced by fear and danger at every turn. Witnesses to Tracy's Faustian exchange in the Merrion Centre in Leeds are Tilly, an elderly actress teetering on the brink of her own disaster, and Jackson Brodie who has returned to his home county in search of someone else's roots. All three characters learn that the past is never history and that no good deed goes unpunished. 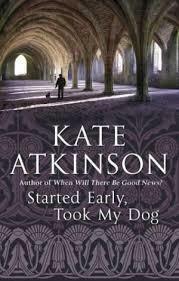 Kate Atkinson dovetails and counterpoints her plots with Dickensian brilliance in a tale peopled with unlikely heroes and villains. Started Early, Took My Dog is freighted with wit, wisdom and a fierce moral intelligence. 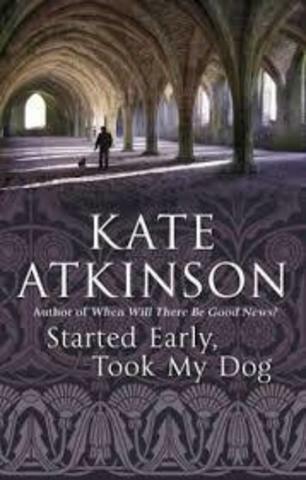 It confirms Kate Atkinson's position as one of the great writers of our time.